Here at iftiSEO, you will get the Best Black Friday Hosting deals and discounts themes, Domains and SEO tools. We have found the best offers and coupons that you wouldn't want to miss out. This page consists of mostly all offers that a blogger, SEO or any internet marketing guy needs to run his business. 67% Off on Shared Hosting, 50% off on VPS and Servers and 40% off on Reseller Plans. Offer available for limited duration. Starts at $2.65/month. Host Unlimited Sites for 1 year at $83. Host Unlimited Sites for 3 years at $178 only. iftiSEO Recommends Bluehost Shared Hosting Plans. Most of my Niche Sites are Hosted on Bluehost. Want Unique IPs?? Get 10 Unique IPs at 80% off. Hosting Starts at $1/month. 60% Off Hosting Starts at just $3.95/mo. Host your site for 2 months for FREE using this Deal. One of the Best Hosting Offers to Host your Money Sites. A great support and Uptime guaranteed. Host Unlimited Domains at just $2.5/month. Renewal also at same price. SSL, Backups, Unlimited Space Included. Trusted by Many of My Friends with one of the Best Support among all the Hosting Companies. You can now Host Unlimited Domains on iPage at just $1.99/month. Special Offer for a limited period. So there were some of the Best Black Friday Hosting Deals of 2018 !! The best offers or coupons are usually applied when you buy hosting for a minimum of 1 year. 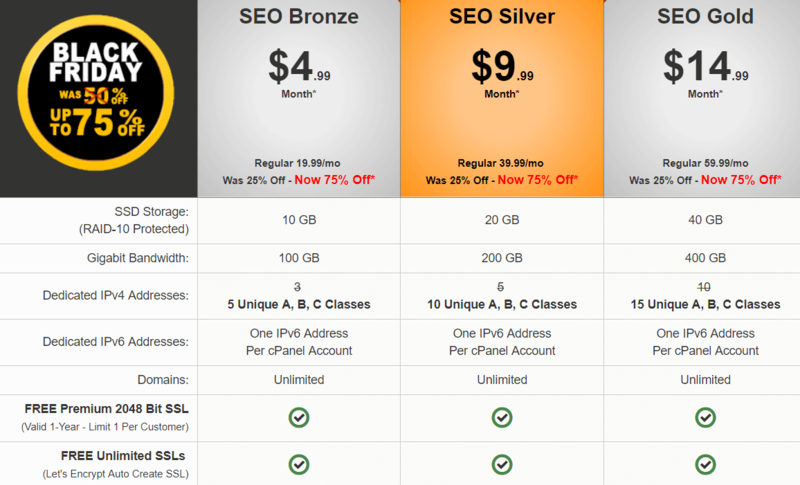 Using the above Hosting deals you can host your website for as low as 20$ per year. All the hosting services listed above are having a good review and are being used by various industry experts. We have not included any hosting service that have a negative review in the entire market. You can freely check up the reviews and buy any of the hosting. I've got many people asking for cheap hosting deals for PBN. Well, Black Friday is the best time to get PBN Hosting as you can literally host a PBN in under $30/year. I have some deals that are cheap and can be used to host PBNs. Infact, a lot of my friends bought the same last year. There are a lot of various themes that you can pick !! Probably in 10000s !! But here are the best. We have listed the best Theme offers (both package or single theme) that you can buy. Do not forget that this is the PERFECT TIME to buy a theme or a membership as you don't get such offers on any other time of the year. Buy the Best Framework along with all StudioPress Themes. Flat %25 Off Everything. The Best Collection of WordPress Themes is here. Even this site uses VOICE theme from Themeforest. Get All Paid themes and Plugins by MyThemeShop for just $87. Its the Best offer if you run multiple blogs. Get DIVI Builder and all Paid themes and plugins by Elegant themes for just $89. Includes Bloom, Monarch, and DIVI too. 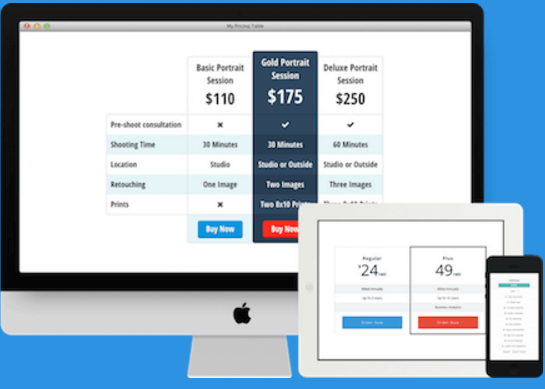 Get All Paid themes for Just $79. You also Get One year support and updates. Get All Paid Themes by TeslaThemes for Just $99. Lifetimes right and one year support included. Industry Experts use Links management to buy high quality safe backlinks. Get any Udemy Course for just 15$ valid during black Friday and Cyber Monday. Kontent Machine Black Friday deal at lowest price. OneHourIndexing offer - F﻿REE 2500﻿ Links per Month. OptinMonster black Friday discount offer. Many of you here are professionally into Blogging, SEO or Internet Marketing !! Right ?? Well then, you must be very much aware of the best Tools used in the industry. That's what we have listed for you down below. These are some of the best SEO, Marketing, Blogging or Social Media Tools that you MUST USE. The one's listed below are used by big names like Neil Patel, Pat Flynn, Matthew Woodward, Rand Fishkin etc. So must understand the power and the potential these tools have. And again, the best time to buy these tools is BLACK FRIDAY or CYBER MONDAY. So have a look at these BEST SEO Tools Black Friday Offers, Deals, Discounts and Coupons. Do you know what's my biggest mistake in Blogging ?? Any guesses ?? The biggest mistake I did is, I never focused on building email lists. I never focused on email marketing, I never thought of how much I am losing by not having good opt-in forms. But now, I have realized its importance. I have started giving importance to building email lists and sending mails to my list. And the results have been awesome. My Emails are having a great OPEN RATE and CLICK RATE !! And this is helping me a lot in terms of getting SALES to the products I promote. Now you can do the exact same thing. If you have a small list of subscribers then I will suggest you to go with a FREE Plan of Mailchimp or GETRESPONSE. While if you have a good list of subscribers, then this is the perfect time for you to buy any of the service listed below. We have listed the best black friday email marketing services offers and discounts !! All you have to do is, follow the link and pick whatever plan you want. Start Email Marketing Today with GetResponse. Avail A Huge Discount on Yearly Plans. No matter how many successful sites you start, the number of domains you own will always be greater. :P Also with event blogging booming high, a lot of us are always in the hunt of cheap domains. But guess what, many of us always end up buying domains at high cost. Well, you don't have to spend more than 2$ on a domain !! This Black Friday and Cyber Monday we have brought you the best Domain offers. Check out the following Black Friday Domain Offers, coupons and Discounts. You can buy as many domains as you want from your favorite registrar mentioned below. All you have to do is, just follow the BUY NOW link and complete your order. Black Friday SEO Tool Offers: About Each Tool ! SEMRUSH: This online tool will help you Audit your site. You can easily check your website's backlink profile along with a list of keywords it's ranked on. Apart from it, you can use this tool to analyze any other site that you wish to. This way you can easily get new keyword ideas, backlink profiles (of competing Sites), CPC Ideas etc. I can only say that if you buy this tool, you will gonna use it every day. Semrush Black Friday offer is allowing you to use SEMRUSH for FREE for a few extra days. So go for it !! WPRobot: Ever heard of Autoblogging ?? or content curation ?? Well, this is the tool for it. It helps you Build WordPress blogs automatically for your PBNs. Import PLR articles and it will auto post for you. And a lot more !! OptinMonster: If you are into building email lists or subscribers then it comes out to be the perfect solution. It has the best lead capturing tools and forms that you can use to build your business. So do redeem the Black Friday Optin Monster deal !!! Grammarly: Well, I am using it currently while writing this page. A must buy !! No more words required. KontentMachine: Build Backlinks, Build Articles, Autoblogging, Built in Spinner, auto embed pics and videos !! The features are endless !! If you are into such type of blogging, then it's a tool worth to discover. UDEMY: Learn anything and everything on UDEMY. You can find courses on every topic and the best part is, its all for just 10$. One of the best Udemy Black Friday offer. The Udemy Cyber Monday 2017 offer will be the same as well. OneHourIndexing: Are you into event blogging ?? If yes, then you probably might be needing an indexer. Onehourindexing is one of the best from the 100s of indexers available in the market. Get it on Black Friday and save big. The page contains affiliate links which of course will earn us a commission but at the same time it will also be the best discount for you.